This is a sequel to his best seller, “Shocking Beauty.” Both of these were published by Timber Press. Hobbs is an internationally known garden and floral designer, and owns Southlands Nursery in Vancouver, British Columbia. This title features breathtaking photos by David McDonald. In this title, he continues to shake up the gardening work by challenging people to cast the usual ho-hum garden design rules aside for a refreshing approach. This allows folks to tap their creativity and transform their landscapes into a rare vision of beauty. He encourages readers to create places where they can unwind from the hectic pace of life. He further believes that the process of gardening can relieve the day-to-day stress in our uncertain, post 9/11 world. In Hobbs’ able hands, the cacti and succulent garden as sanctuary takes on a whole new meaning, and this is by no means meant to be a staid, soothing place where nothing ever happens. Instead, these are stimulating spots to appeal to all of our senses where we can commune with nature through the very act of gardening, spots where the beauty of plants is further magnified by garden art, accessories, and furnishings. Hobbs stresses the importance of foliage over mere flowers. Flowers are nice, but they only provide incidental interest. In this book, Hobbs avoids the usual kinds of chapters one sees in garden design books, and explains how we can make the garden more interesting. For example, he suggests adding color through the use of non-plant materials, such as walls and structures, and promotes the use of forgotten and ignored kinds of plants. He does stress the use of color, and reminds us that it important to be able to create powerful color combos. In addition, he explains how we can best use sound, fragrance, and other elements to stimulate our minds and senses. This is done largely through compositions and staging. He also considers the style of the house when designing dynamic gardens. In one chapter called “Stirring Up Ghosts,” he explains how he talks to his plants, and encourages people to get in touch with their unbridled, wacky sides. He also sees plants as living memorials to friends who have passed on. In another chapter, he recommends playing favorites, encouraging folks to use their favorite kinds of plants to avoid what he calls “safe gardening.” So far as container gardens are concerned, he prefers distinctive old or antique pots to the modern plastic ones. For potting soil, he creates his own custom mix using commercial ones as a base. Cacti and succulent lovers will find that Hobbs is definitely a real fan. The book features an entire chapter to this subject. For that reason alone, it belongs in the library of every cacti and succulent gardeners, particularly those gardening in cold climates. Hobbs is totally besotten by cacti and succulents, and a definite candidate for a twelve-step program for plant addicts. 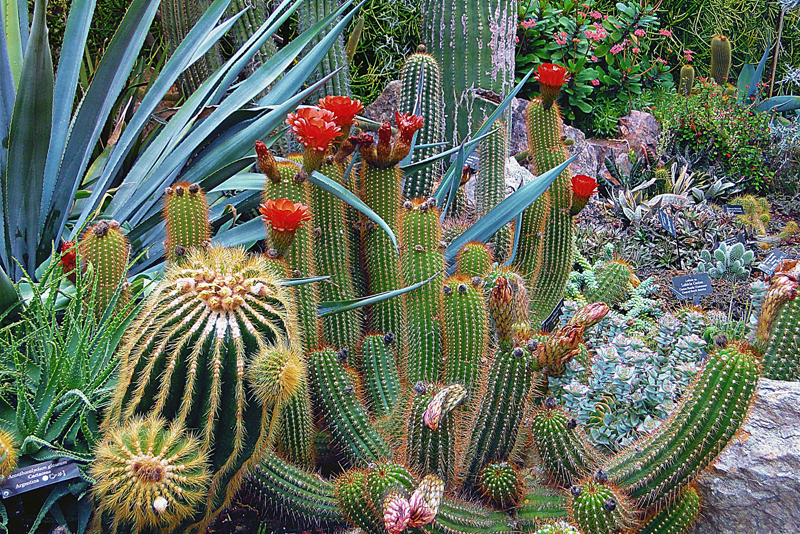 In his garden, he grows a large number of hardy and tender cacti and succulents in pots as well as in garden beds. One picture shows succulents growing on top of a wall. All of his succulents are so beautifully arranged and displayed that it really does look like a jewel box. In one chapter, he recalls how he carried some succulents as carry-on, and stored them in the overhead compartment on the plane. This book gives us one more reason to love our favorite cacti and succulents, and use them as much as we can in the garden. The book features photos of Hobbs garden along with others that illustrate his design concepts. He critiques these gardens to show why the ideas work. Some of them show rather non-traditional materials as accents, such as a colorful umbrella.